This program is for tournament tough players learning to compete and have a strong desire to improve and continue with the game to the next level. Athletic skills training and conditioning are part of the Junior Development program. The Celsius International Program is intended for visiting high school age athletes who won’t be living with their families and would like a comprehensive program and tournament play in Florida. These players have aspirations to play the game at a high level and look forward to playing at the collegiate levels and beyond. Celsius Tennis Academy runs the tennis portion of this program and Elevation Preparatory Academy provides the academic and mentoring portion of the program. More information and pricing on our program with Elevation Preparatory Academy. Includes travel to extensive schedule of tournaments throughout Tampa Bay, Bradenton and Sarasota areas. Cost includes travel, on-site coaching and tournament registration fees. Additional fees will apply for tournaments requiring overnight stays. For academic and lodging options visit our international page. This program is for dedicated homeschool players who are looking to get a jump on their day improve their game with more one-on-one attention from the coaching staff. Students participating in the 180 degree afternoon program as well receive a $125 credit per month and $75 per week. This program is for area and visiting players of any age. The program is daily without any ongoing commitment. To supplement your training many academy athletes take private lessons as part of their regular training or to prepare for a specific event. 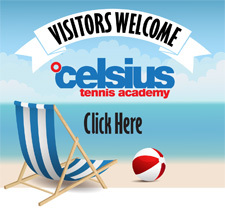 Celsius Tennis Academy offers private instruction from any of our coaching or training staff outside of our regular training hours and weekends. For questions, to schedule or to see who is the best coach for your private text or call Cary Cohenour, director at 941.737.2635. Private lessons range between $70 – $115/ per hour.